Ship Weight : 10 lbs. 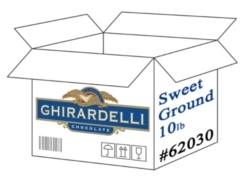 Ghirardelli Sweet Ground Chocolate Powder delivers a great tasting product for usage in desserts and hot beverages of all types. Comes as a 10lb case. $0.27 / oz. $0.26 / oz. $0.25 / oz. $0.23 / oz.